PAUL JAY, SENIOR EDITOR, TRNN: Welcome to The Real News Network. I’m Paul Jay in Washington. 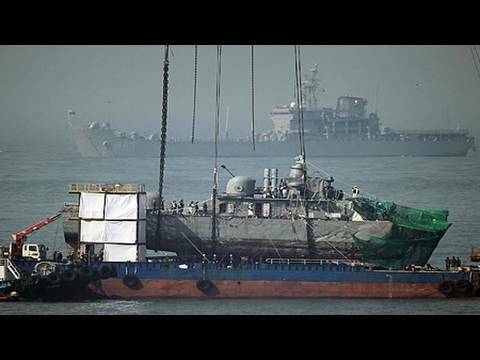 On March 26, a South Korean warship was attacked by a torpedo. The South has accused the North of killing 46 South Korean sailors. Now here to help us discuss this is Larry Wilkerson. He’s Colin Powell’s former chief of staff and teaches national security policy in Washington. Thanks for joining us. JAY: So what happened on the 26th? What do we know about it? 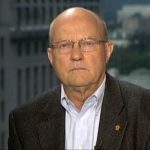 WILKERSON: I think, as best as we can tell, a North Korean mini-sub or small submarine fired a fairly sophisticated torpedo at, as you said, a South Korean warship. And this is a torpedo that doesn’t strike the side. It goes at a prescribed depth, and when it explodes, it pushes a huge water column up. And that water column then forces the boat, the ship into the air, and the very weight of the ship at stern and bow cracks the ship in half. And so you get a catastrophic failure of the ship and you get a sinkage. I would imagine that people died a very horrible death drowning. Maybe some died in the initial explosion that occurred underneath the ship. JAY: And how do we know that it’s a torpedo? How do we know that the North did it? People are assuming this. WILKERSON: Now, the South Koreans were very, very careful to go about this forensic search in a very detailed and disciplined way. I’ve served in Korea many times. I know how disciplined and detailed they can be. They found the twin-blade propeller from the torpedo, they found some of the casing of the torpedo, and they analyzed it. They went about a very detailed forensic search. And they came to the conclusion that it was a North Korean torpedo. JAY: Now, why would the North do this? The North is denying it. They’re saying that this is being done to facilitate the reelection of the South Korean prime minister. The South has returned by re-designating the North as its main enemy, which—apparently it dropped that phrase a few years ago. So how real is this tension? Because these sort of things seem to happen between North and South every year or two. WILKERSON: They do. You can go back to their taking of our ship, the Pueblo. And some, I think, 80-plus sailors were maintained in jail for a year or so during the Johnson administration. And the latest one, as I recall, was in ’96, where they actually planted some commandos from a small mini-sub on South Korean soil. The South Koreans had to hunt them down. And as you know, the Rangoon bombing, the take-down of the South Korean airliner, and so forth. So these kinds of things that happened throughout the history of this Cold War relationship across the DMZ [demilitarized zone], I think North Korea does it—it’s brinkmanship, some would say. Others would say it’s to get people’s attention when we don’t seem to be paying them enough attention. And it’s a provocative act to prove that they—as they say, they are a sovereign nation, and they will respond to threats, and they will do the things that are necessary to keep their security intact. I think more than anything else, though, it’s an attention-getting measure when they feel like they’re being ignored, and I would say that’s probably the case here because they have been, essentially, ignored by both the United States and South Korea, despite the rhetoric to the contrary, since they essentially backed out of the six-party talks and went ahead and, of course, tested not one but two, we think, nuclear weapons. JAY: Now, Secretary of State Clinton’s in China, and the timing of all this is pretty—not coincidental, one would think. China has more to say about influencing North Korea than anybody else seems to. What has China said so far? And what might China do here? WILKERSON: Well, first, I think that’s a misconception that a lot of people have, in Northeast Asia not so much, but certainly in America and elsewhere in the West. The Chinese have what I call two types of control, and those two types of control don’t really give them much control. One is the support that they give to North Korea—the heavy fuel, the other things that they do that buttress up this really bankrupt regime. And the second is the diplomatic words, the political words that they can say to Pyongyang from Beijing or that they can bring pressure to bear with. They don’t jive, because the North Koreans are going to do what the North Koreans want to do and the Chinese are going to continue to support. And increasingly that support does not have much influence on North Korea’s behavior, because North Korea knows from the past track record that China will not back away from its support. So North Korea becomes increasingly defiant of China, and China therefore has less and less control. The Chinese are very fearful of a catastrophic failure of the regime in Pyongyang, because that area that borders North Korea and China is not an economically viable portion of China right now; that is to say, it doesn’t enjoy the standard of living of a Shanghai, or a Beijing, even. It’s a very difficult area economically. And if you suddenly had, say, 20 or 30 million North Koreans, which is the anticipated outflow from a collapsed North Korean state, China would have a real problem on its hands. Not only that, it would lose the buffer it has between a US ally, South Korea, and itself. JAY: Well, what do we know about the North Korean armed forces and its leadership? Is there direct ties with China? Do they get their training from China? And what is the speculation of North Korea going forward and the role of the military leadership? WILKERSON: I think the connections there are tenuous at best anymore. They got lots of training from the Russians and lots of training from the Chinese in the beginning—"in the beginning" meaning the beginning of Cold War, right after the Korean War. But there’s less and less contact, certainly less contact with the Russians, and a lot less contact with the Chinese in that regard, though military sales still take place and so forth. But the North Koreans have tried to implement their philosophy of Juche, which is self-reliance, in essence. And so they essentially depend on themselves. They market missiles around the world. They counterfeit our money. They do all manner of illicit activities to garner hard currency, and they get hard currency. For example, they were running operations out of one of their embassies overseas, for example, until the country that they were in found out about it, and that’s against the Vienna Accord, so they essentially told them to stop or get their embassy out of their country. But they run counterfeit money with their diplomats in the briefcases that have diplomatic immunity and so forth. They’re the closest thing to an Al Capone country; they are a criminally run country, and they make their hard currency off of criminal activities. And that’s one of the reasons we fear their ability to trade things with terrorists and so forth. JAY: But why cause a provocation at such a level [inaudible] South Korean—what kind of attention you get when your economy’s collapsing and—? WILKERSON: That’s a new dimension to this crisis, I think, that makes it particularly worrisome. In 1994 we were very close to war on the Peninsula, according to many people, including Secretary of Defense Bill Perry. Gary Luck was our commander in Korea. I took a Marine Corps seminar over there in ’94 and got this sort of, you know, appreciation from his intelligence people and from the general himself: very close to war on the Peninsula. And people are saying now we’re back to ’94 again for different reasons. I think the difference today is the uncertainty about Kim Jong-Il’s hold on power in the North. There is a very wide body of expert opinion that believes that Kim Jong-Il does not have as good a control over his generals, over his corps commanders, and so forth as perhaps he had in the past. This comes about from a number of things, not the least of which is he’s made some horrendous errors in the last year or so, not the least of which was this kind of market-opening reform of the currency and so forth, which they had to back away from really, really quickly. And it made what you might call the privileged class in Korea—which consists largely of military atomic scientists and so forth at Nyongbyon—it made them suddenly begin to doubt his leadership, and it took a real hit in their standard of living. I’m told that recently he ordered luxury sedans for all of his generals. This is something that he does in order to try and placate them. I’m not sure he’s placating them anymore; I’m not sure there isn’t some question in their minds about his ability to lead the regime. And my South Korean colleagues who follow these issues here in the Ministry of Defense or think tanks or so forth have been telling me for a long time that they believe Kim Jong-Il is the last of the Kims—the dynasty will end with him. So that brings into question the Kim he’s trying to groom as his follow-along leader now. My South Korean colleagues think it’s probably going to be a coterie of generals that’s going to rule South Korea after Kim Jong-Il, and they think they can deal with these generals and gradually bring about—maybe it’ll take a generation, but bring about a reunification of the peninsula through these generals. They’ll buy them off; they’ll do whatever is necessary. I’m not sure that’s not a fairly plausible scenario, but first you’ve got to do what you need to do to deal with this really rather erratic leader. JAY: Is there anyone that gains if war breaks out on the Peninsula? Who’s got to gain from this? WILKERSON: I can’t find anyone who gains. JAY: I mean, if you go back to Richard Perle’s book, Perle actually wrote that he thought that the US troops should pull back to the south of South Korea and encourage South Korea to take on and get rid of North Korea. WILKERSON: There’s only one fly in that, and it’s a huge fly, and it’s the beautiful capital city of Seoul. If Seoul were not positioned where it is, right on the demilitarized zone, if Seoul were not in range of massive North Korean artillery—. You know, as a military person I could subscribe to a theory like that. But because Seoul is there and would take massive casualties and would be fairly much destroyed in the artillery barrage alone that North Korea could mount—the South would then win. It would go all the way North to the Yalu; it would take over the whole peninsula. There would be massive casualties, some have estimated as high as 100,000 in the first few weeks, but Seoul would win. No question it would win. But their capital city would be destroyed, and it would be a major rebuilding effort, and so forth. So the South Koreans don’t want that to happen. So there’s some—. JAY: So nobody really wants this war, although sometimes people and forces that don’t want war, things spiral out of control anyways. WILKERSON: Sometimes that’s the scariest period. I think back to August 1914 and I think to a number of lesser conflicts that were, right before they erupted, people have said, "Nobody wants this war," and yet it happened. Passions get inflamed, nationalisms gets thrown out, and you need something to maintain your political power, and all of a sudden you’re at war. This is what scares me about this particular time. I was not nearly as concerned as others in 1994. I am concerned this time. And I’m concerned for other reasons, too. I’m concerned because I don’t see my own government paying a whole lot of attention to this, except in the last few days. I’ll give you an example. I was at a fairly high-level meeting with some fairly high-level people from the Obama administration recently, and no one in the entire group brought up Korea. Afghanistan came up, Iran came up, Iraq came up, the global financial and economic meltdown came up, almost every other issue you might imagine came up, but no one mentioned Korea. It was very disconcerting.